Greetings One and All! Please join us at the market this Sunday as we say goodbye to July. August is just around the corner. Discover the magic of the market. 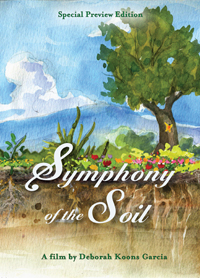 Introduce yourself to a new farmer or vendor. Search out a fruit or vegetable that you have never tried before. Every week there’s something new and wonderful to experience. At the market this week you will find eggplant, peppers, tomatoes, cucumbers, green beans, broccoli, romanesco cauliflower, onions, scallions, summer squashes, fennel, kale and other braising greens, lettuces, micro greens, avocados, potatoes, beets, carrots, herbs and much, much more!! Have you ever tried tomatillo salsa? They’re back..Yum!! Stone fruits are still in season. Find peaches, plums and nectarines. Lots of berries to be found through out the market..it could be the last day for blueberries so get them while you can!! And did you say raspberries? Yep!! You can find them at Laguna Farms booth. In the next week or two expect to find melons and Gravenstein apples. Look for Paul’s Smoked Salmon back at the market this week!! For real this time!! In the mood for pasta? Check out Beet Generation’s pasta kits for a quick and easy pasta fresca..add Bodega goat cheese, Gourmet Growers mushrooms and Olivino olive oil. 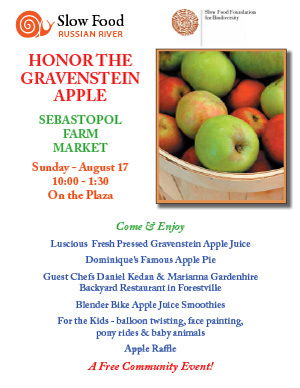 August 5th – Gravenstein apple press pre-fest – Learn about the Sebastopol Community Apple Press. 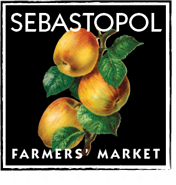 Russian River Slow Food will be demonstrating with local Gravenstein apples, the magic of pressing apples into juice. There will be plenty to sample. 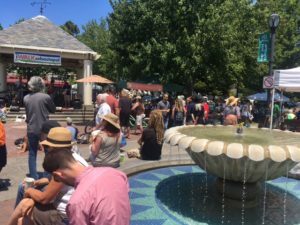 August 12th – Bicyclettes Pour la Paz (the bicycle band for peace) is on tour and will be stopping at the Sebastopol Farmers Market to play. We are very lucky to have them. Come join us for another amazing day at the market! !